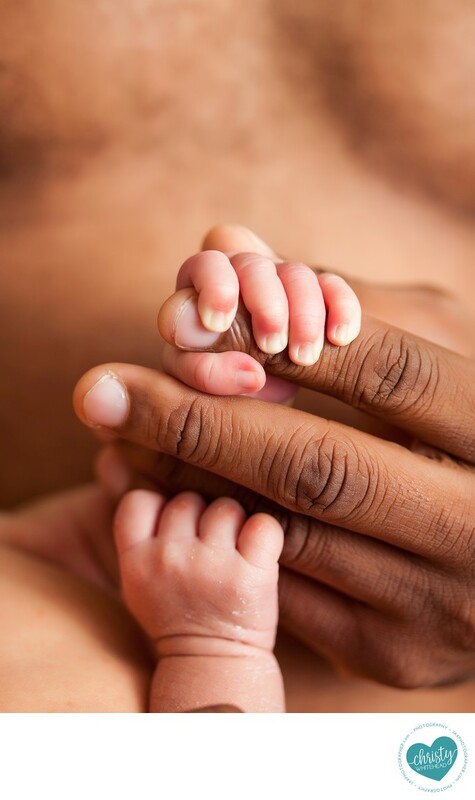 tiny baby fingers wrapped around dads fingers - Newborn Photography | Schedule Your Newborn Shoot Today! It takes just 12 short months for your baby to transform from helpless newborn to active toddler. It's an incredible transformation that often leaves parents wondering where their newborn went. From birth to 6 months, a baby might grow 1/2 to 1 inch a month and gain nearly a half of a pound a week. By 5 months of age your baby will likely double their birth weight. In fact, by the time your baby is 2 to 3 weeks old they will start to lose their "newborn" look. It's amazing how babies grow and change at an astounding pace, and every month brings new and exciting developments. Which is why I'm such a huge proponent of newborn photos. They say the years are long but the days are short and it couldn't be more true for newborns. Those tiny fingers that wrap around yours, the little button nose, the bald head and itty bitty ears will quickly begin to grow and change until one day, you can't imagine them ever being that small. I want to create artwork for you to look back on when your babies are grown. When they have babies of their own I want you to be able to pull out a photograph I captured to compare the resemblance between then and now. Christy Whitehead Photography is a leading newborn photographer in North Florida.